To replace a field, open Edit | Replace menu, or click Ctrl-R. Select the field in the Field drop-down list. In the Search and Replace on edit boxed specify the symbols to be replaced. 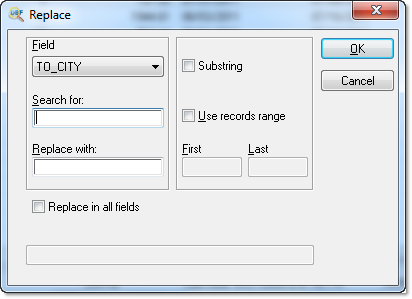 Optionally check the Use records range box and specify First and Last records for replacement. Check the Substring box if you want to replace not the whole field but the specified part of it. For replacing the whole field, you may use a wild card. The replace command can replace in memo fields.